Given the low turnout at the fall meeting, the question has again come up as to whether we should just have one meeting per year. Speaking for myself, I would see this as a step backward for VCBS. I think we should continue with the spring and fall meetings, and that we should continue to hold them throughout the state, in any Town that has a covered bridge. The best way to ensure a better turnout is for VCBS to enlarge its membership. I would appreciate any comments from the membership on this subject. Thank you. At press time, the details of the Spring meeting have not been confirmed. 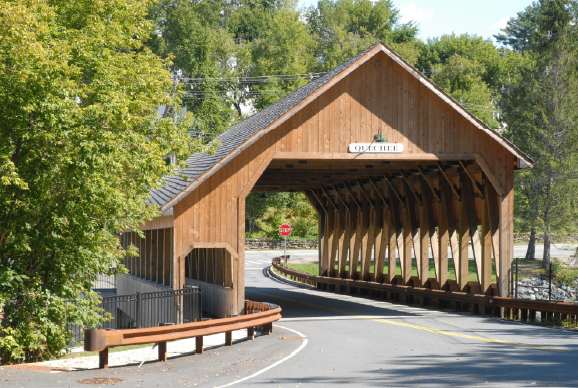 A query has been sent to the Pittsford Historical Society for a meeting place and a speaker to present Pittsford's covered bridge history. We are shooting for early April. Full details to follow in the Spring Bridger. * * * Return to top	A New Challenge for the Vermont Covered Bridge Society! When we applied for permission to place our posters on the State owned covered bridges through Laura V. Trieschmann, State Historic Preservation Officer, she suggested that "[while your] concept, however, is a great one that may be better served by our Historic Roadside Marker program. I would love to work with you to have signs created for all of the covered bridges; many do have signage but most do not." Information on the marker program can be found on their website http://historicsites.vermont.gov/roadside_markers. Currently, of the 101 historical covered bridges in Vermont, only eight have historic signs: Cambridge Junction, Hammond, Shoreham RR, Baltimore, Scott, Fisher, Taftsville, and Henry. That's a situation we of the VCBS can fix with our archives and another handy source of information on our historic bridges to be found in the applications for the placement of most of our bridges on the National Register of Historic places. Please, all of you historians, check out the website Ms. Trieschmann provided and if you feel challenged, contact me, Joe Nelson at jcnelson@together.net, or write VCBS, PO Box 267, Jericho, VT 05465. In October, Christopher Marston - Architect & Project Leader for the National Park System Historic American Engineering Record's (HAER) National Covered Bridge Recording Project - announced that the Brown Bridge (WGN 45-11-09) in Shrewsbury, Vermont, and the Duck Creek Aqueduct (WGN 14-24-11) in Metamora, Indiana, have both been officially designated as National Historic Landmarks. The Brown Bridge was built in 1880 and is one of the most outstanding surviving examples of a Town Lattice Truss. The Duck Creek Aqueduct was built circa 1846 and is an exceptional example of 19th century covered bridge construction, a rare surviving component of the American canal system, and, the only historic covered wood aqueduct in the United States. 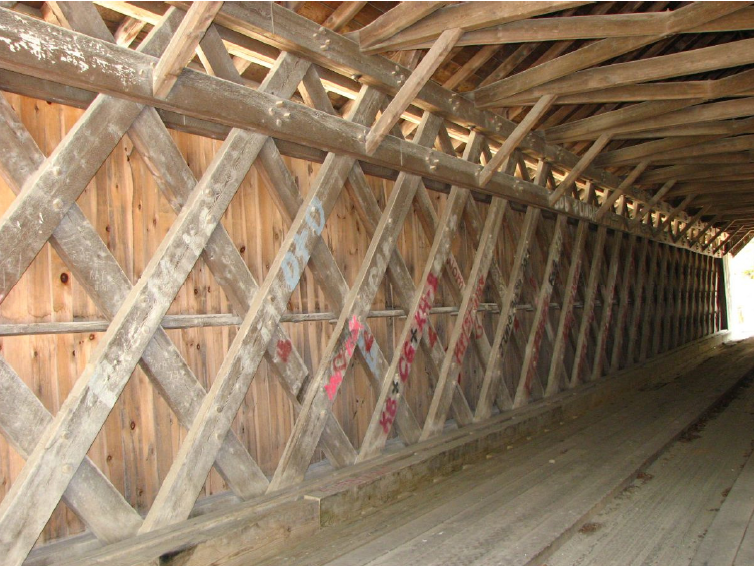 They represent a 12-year effort by HAER as part of the Federal Highway Administration's National Historic Covered Bridge Preservation Program (NHCBP). Marston went on to acknowledge historian Lola Bennett, who researched and authored the National Covered Bridge Context Study, and, the support of Joseph Conwill, who shared "his encyclopedic knowledge of historic covered bridges". These two bridges join the Humpback Bridge (WGN 46-03-01) in VA and the Knight's Ferry Bridge (WGN 05-50-01) in CA designated National Historic Landmark's in 2012. The Fifteenth Annual Fall meeting of the Vermont Covered Bridge Society was held in the Ilsley Public Library Meeting Room in Middlebury, Vermont on Saturday, October 4, 2014. The meeting was dedicated to Senator Jim Jeffords in gratitude for his efforts as a United States Senator to acquire funding for the preservation of covered bridges in the United States. Bill McKone spoke that it is appropriate to dedicate this meeting to Jim Jeffords inasmuch as he was instrumental in preserving the existence of covered bridges in Vermont and in the country as a whole. The VCBS is indebted to him for the initiative in forming the Vermont Covered Bridge Society. 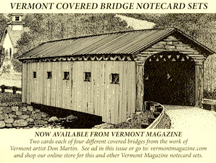 VCBS President Bill Carroll went on to say, "Senator Jim Jeffords is more or less the Grandfather of Covered Bridges not only in Vermont; but throughout the USA." Minutes of the Annual Spring meeting held in Rutland, VT on May 10, 2014 were published in The Bridger. A motion to not have a reading of the minutes was made by Ruth Nelson and seconded by Bill McKone. Membership: Suzanne Daniels reports that it has been quiet on the membership front. It is reported that three members seriously in arrears have updated their memberships. One in arrears since 2012 has paid up through 2015. Another has secured her membership through 2016. Events: No plans have been made for the spring meeting. Lyndonville has been suggested for a site, as has Tunbridge with Euclid Farnham to speak and Pittsford. As a result of working with Selectboards of our Branding Project, we have new connections to Pittsford with its four bridges. Conversations with the Pittsford Historical Society President, Stephen Belcher, show promise and could be also be tapped for speaker and meeting accommodations. He has forwarded to us some covered bridge history of his town. The purpose of the Branding Project is to let people know that there is a Vermont Covered Bridge Society. Communications: The Selectboards of 47 towns were contacted regarding the VCBS Branding Project. As of the date of the meeting 15 had responded positively: Weybridge, Arlington, Lyndon, Danville, Montgomery, Morrisville, Thetford, North Troy,Pittsford, Proctor, Brandon, Marshfield, Dummerston, Grafton, and Brownsville. Irene and Ed Barna will be posting the Addison County bridges. Posting of some bridges will be done near the bridge, not on the bridge itself, as some bridges, such as the Pulp Mill Bridge with its two narrow travel-lanes, are not safe for pedestrians. Ray Hitchcock has spoken to Mrs. Sue Hammond who says permission to post the Bartonsville Bridge will be voted on in October. Passed around to those in attendance was one of the badges to be posted in the bridges. For attachment to a bridge, it was recommended that double-sided tape on the back of the plastic-encased badge be used to apply the badge, then staples or nails be used to further secure the badge. It was noted that the Pittsford Town Road Commissioner supervised the application of the badges to their bridges. Ruth Nelson questioned, "If not posted in a bridge; but near a bridge - does that mean acceptance?" Yes, it was stated that safety was the concern for the actual location of the posting. Joe Nelson reported that the Historical Society of Pittsford warmly received the signage. He then went on to explain how, by using an i-phone; the QR code information printed on the badge would read the VCBS home page. From there the viewer could proceed to the map of Vermont counties, then access to pictures of each of the covered bridges by county. Clicking on a bridge photo, information about that bridge is available to the viewer. It was then questioned if a no reply from a town was received via the return card, would a follow-up phone call be made? Joe replied that an effort would be made to reconnect with that Selectboard so that an explanation of the size of and the procedure of placing the badge is understood. A copy of The Bridger will be sent to Selectboards that have not consented so that they are made aware of the number of towns that are in acceptance. A plea will be made at that time for permission to post the Code Badge on the bridge in that town. Bill McKone asked if the number of viewers could be tracked by the code. Joe Nelson replied that it could not; but a counter could be added to the VCBS web site to see how many are viewing. 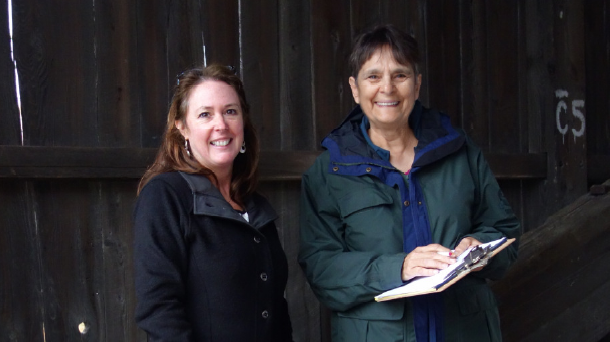 Publicity: Joe Nelson reports that Ellen Everitz has been concentrating on giving publicity information in advance of VCBS meetings to local publications for town calendars as well as to two television channels for mention of VCBS meetings. Ellen wishes to step down from that position; but will continue to refine address lists as she has been doing for some time. Johnny Esau will take on the chairmanship of the Publicity Committee. Bill McKone will take on the position of writing press releases to be submitted in the context of Public Affairs. Bill also inquired if there had been an attempt to reach the coordinators of, for instance, Middlebury College, the Vermont Folk Life Center, or the Henry Sheldon Museum, for this fall meeting in Middlebury, in the interest of local publicity. He suggests contacting coordinators of organizations in towns where our meetings would be held for their assistance with additional publicity. Bill also suggested letting more people know about the meetings such as communicating with town Selectboards. Three Selectboards are cooperating thus far: Thetford, Tom Carpenter working with Rutland, and Bruce Laumeister with Bennington. Romantic Shelters: Joe Nelson mentions that there is a new romantic shelter in Rutland. No further details were given. In reply to a question for a definition of a romantic shelter, Joe replied that it was not an historic covered bridge. It was added that if the pledged money was not used within 2 years of the vote; the money would revert back to the VCBS. This TIME LIMIT would apply to any VCBS donation going forward. Neil Daniels reports that the Board has not voted to transfer gift money of $472.00 to the Save-A-Bridge Fund. Joe replied that there will be an annual Board of Directors meeting by February 2015 for transferring the money and recommends that the Hectorville donation come from the checking account rather than the Save-A-Bridge Fund until the details are resolved. The Branding Project was brought up again to emphasize that the purpose of the project is to let people know that there is a Vermont Covered Bridge Society. Hopefully, local Selectboards and Historical Societies could post VCBS meetings in electronic newsletters. A letter acknowledging the gift of $2,000 to Hectorville will be sent with the 2-year time limit stated. Joe Nelson will write the letter. Ruth Nelson recommends the VCBS have only one, an annual, meeting each year instead of two as attendance has declined. This topic will be brought up at the Board of Directors meeting to be held by February 2015. Bill McKone suggested regional meetings – that there be one annual meeting and other meetings be held regionally. Joe Nelson recalls that, historically, the arrangement was to have local meetings, such as cook-outs, in towns having covered bridges hosted by the local folks. One annual VCBS meeting would be held. Bill will follow-up with Cambridge for the Branding Project. Next meeting date or site were not selected. No further discussion, a motion to adjourn the meeting was made by Neil Daniels and seconded by Bill McKone. Adjournment was at 10:50 am. Bill McKone was the speaker of the morning telling the group about the restoration of and ongoing issues with the Cambridge Junction/Poland Covered Bridge in Cambridge Junction, VT. I was born in Rutland Vermont and now live in Carrollton, Virginia. I look forward to visiting Vermont and this year I decided to visit for my 67th birthday in September 2014. As I usually do when visiting, I end up traveling around the state and photograph the Covered Bridges. I have been doing that for many years and I enjoy it very much. This year I decided to concentrate on three bridges that have had some major work done to them including rebuilding those damaged by Hurricane Irene a couple of years ago. So leaving Rutland, I traveled on route 4, east toward White River Jct. Along the way I photographed the Taftsville Bridge and then the Quechee Bridge. The next day I went north on route 7 and in the Middlebury area I photographed the Pulp Mill Bridge. All three had major overhauls and the photos accompanying this article show you what the bridges looked like in September when I was in Vermont. Also while I was visiting, I traveled to Proctor to photograph the Gorham and Cooley bridges and then up route 7 to photograph the Hammond Bridge. Lastly as I was leaving Vermont, I traveled down to East Arlington to photograph the Chiselville Bridge and then to route 313 West out of Vermont and photographed the Batten Kill bridge in West Arlington. So that concludes my visit to Vermont for this time. Next June I will be in Vermont for my class reunion and will take that opportunity to again photograph the Covered Bridges in Vermont. Wanted: Volunteers to assume duties of Membership and Events Committee Coordinators. Wanted: Reporter/correspondents to bring local covered bridge news to The Bridger. Wanted: Volunteer worker-bees are needed by the Events Committee to help set up meetings and assist in hosting them. Seguin Bridge, built in 1850, is a 71 foot long multiple kingpost bridge with a Burr arch. It crosses Lewis Creek in southeastern Charlotte in an area that was primarily farmland but is now becoming second-growth woods, and is likely named after abutting land owners of the mid-1800s. The builder is unknown, but may be the same person that built Quinlan Bridge, a similar bridge a few miles downstream. In 1949 major repairs were done to the bridge, and steel beams were placed beneath the floor. Materials in the VCBS Archives relating to Seguin Bridge are a number of color photographs taken in the 1990s and early 2000s. Quinlan Bridge, built in 1849, is an 86 foot long multiple kingpost bridge with a Burr arch. It crosses Lewis Creek near the southern boundary of Charlotte, a few miles downstream from Seguin Bridge, in an area that is predominantly farmland. Like Seguin Bridge, it was probably named after abutting land owners. The builder is unknown, but given the similarity and proximity of Seguin and Quinlan Bridges, both were probably built by the same person. In 1985 steel beams were placed beneath the floor to enable the bridge to support the weight of school buses and modern fire engines. Materials in the VCBS Archives relating to Quinlan Bridge are a number of photographs taken between 1960(?) and early 2000s. The Historical Committee is always looking for newspaper items, photographs, and other materials relating to the covered bridges in Vermont for our archives. Vermont Protective Coatings workers recently completed a painting project on the bridge, which had been repaired during the summer to correct minor, non-structural damage during 2014 from over-size vehicles passing through. The painters slung corrugated steel scaffolding under the bridge (via cables) to provide a safe but rather precarious place to stand on while working (the scaffolding is visible in the photo). Local (Sunderland) carpenter Mike King replicated the two 'one dollar fine' signs to replace the badly weathered signs (which were replicas that I had painted some 25 or more years ago). Unfortunately, vandals struck and spray-painted graffiti on the north end of the bridge during Halloween, but the paint crew quickly returned and repainted the north end to restore the bridge's normal appearance. Adrienne and I have just completing the branding project on nine Windham County bridges. It was fun to revisit these fine old friends. While we were doing the branding we completed our VCBS bridge inspection checklist. Adrienne did the leg work and I took pictures. We have had good response by road authorities to recommendations we have made over the years. These inspections most frequently have related to cleaning debris, minor repairs, signing or brushing. After Hurricane Irene did its damage Bartonsville, Worrall, and Hall covered bridges were brought back to like new or with Bartonsville to new condition. We have enjoyed working with Mike Hindes and the road crew from Rockingham for several years. The Victoria/Kissing Bridge has completed our recommended signing and siding repairs. The Vermont Country Store has recently replaced floor joist and decking. There is a lot of kissing left in this restored bridge. The branding went well and we supplemented with stapling the four corners. On metal kiosks, we will need a better way to adhere the brand. Several of the bridges we branded are quite busy and also attract tourists. VCBS may want to support information kiosks to lessen conflict between peepers and regular traffic. Please join me in welcoming new member Norman Tjossem of Ripton, Vermont, to our group. A warm welcome to you! 2015 Early Renewal Contest - We are pleased to be able to once again offer our Early Renewal Contest. This contest has been a huge success in the past and helps the Society in many ways. Paying your membership fees before the December 31 deadline not only qualifies you for a chance to win a nice gift, but gives the society the funds it needs going in to the new year. Winners will be announced in the spring issue of our newsletter. You may have noticed a mysterious code on the mailing label on your Bridger newsletter. The post office uses your name and address, of course, to deliver the paper to you. But what is this other thingy; Jane Doe I(14)? The code declares that Jane holds an Individual membership paid up through December 31, 2014. What does it mean when you code turns red? It means you are in arrears, please renew your membership. If your red code is additionally underlined in red, it means you are really late, and we are worried about you. Individual, Family, and Student, are annual memberships and need to be renewed each year. L and LC members have opted to pay their dues in a lump sum. CM is paying his or her way by providing a needed service to the Society. Alas, you members receiving your Bridger as PDF don't get a mailing label. Some of you are in arrears, so please, if you are, remember us. A Burlington Free Press article from August 26, 1940 stated that since 1927, 432 covered bridges were removed from the State highways in Vermont. A lot of them went out in the '27 flood, but the rest of them disappeared in the years following. This only counts the bridges on state highways and does not include those lost on town roads. In 1940 there were 168 covered bridges left on the State highway system. At that time the writer was very proud that only 12 covered bridges came down in that year. 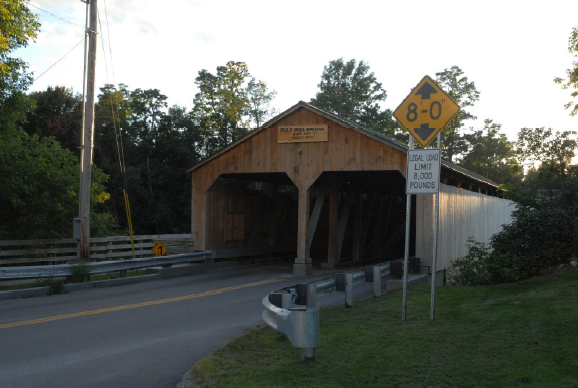 Vermont has lost 168 covered bridges from the State highway system in the last 60 years. Some of those bridges are not gone but are now on town roads that were at the time state roads. I've been working for the state of Vermont in historic preservation for almost twenty-six years, and we have not, in that time, lost a covered bridge through demolition in order to make way for a new bridge. That is an excellent record and shows that in those years issue was not about whether or not to preserve covered bridges. The issue is now over how best to do it. All those working on the covered bridges recognize that some past repairs have been made that only marginally met preservation and engineering standards for a variety of reasons. Not having accurate or complete information makes good preservation decisions difficult. For example the "real" strength or actual condition of components may not be known when we make decisions on bridges. There is also an "engineering gap," with covered bridges that often leads to a much lower load rating than the bridge carries on a regular basis. This may come from using low strength estimates for the wood in the bridge rather than more accurate values based on observation and analysis of the actual wood species and quality found in the bridge. It may be because wooden bridges are very complicated structures where loads are transferred from one member to another in unexpected ways because of the resiliency of the wood or the way the pieces are joined to one another. Therefore a traditional engineering analysis may show a capacity far lower than the actual capacity. Potentially inaccurate information that underrates a bridge impacts preservation decisions because it results in far more work being recommended than is needed to make the bridge functional. Good preservation calls for as little work and change as possible to get the job done. Engineering decisions and preservation decisions can only be as good as the information available to make them. The Agency of Transportation is testing bridge components as integrated units rather than as individual pieces to help reduce the "gap" and there is a growing advocacy for more nondestructive testing of bridge components in place. In addition more care and consideration is being given to all repairs. Now and in the future the Covered Bridge Committee organized by the Agency of Transportation assures that a broad scope of ideas coming from engineers, preservationists, The Vermont Covered Bridge Society and the towns are taken into consideration when work is being planned on a covered bridge. The Covered Bridge Committee reviews all work on covered bridges based on a Covered Bridge Plan that establishes priorities and best practices for covered bridge work. We are setting a national example in our approach to covered bridges. I am looking forward to the best possible preservation decisions being made about the preservation of covered bridges in Vermont because of the cooperation of two state agencies, the public and the towns owning the bridges in searching for innovative solutions. At one time, New York State had over 300 covered bridges, but over the years, floods, fires and modernization have claimed all but 32 of them. Located in Glimmerglass State Park, the Hyde Hall Covered Bridge is the oldest existing covered bridge in the United States. The Old Blenheim Bridge was the longest single-span covered bridge in the world until it was washed away by Tropical Storm Irene in 2011 when the Schoharie Creek flooded. Today, Oxford, New York, is home to the Theodore Burr Covered Bridge Resource Center, which was specifically designed for covered bridge researchers - the first-ever center of its kind. 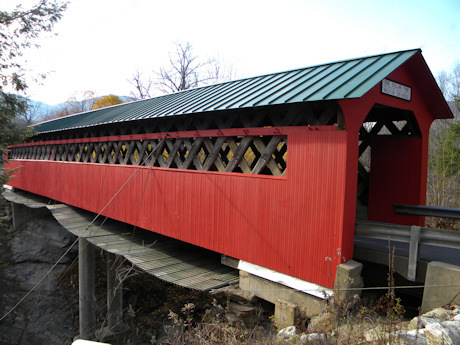 Bob and Trish Kane first developed an interest in covered bridges in 1993 while vacationing in Vermont. Bob enjoys studying their architecture and trusses, while Trish enjoys researching their history and photographing them. Her photography has been featured in Pennsylvania Magazine, the I Love NY State Autumn Tourism Guide, Architectural Digest and many calendars. Their desire to help preserve these historic structures for future generations to enjoy is more than just a desire; it is a passion they actively pursue. 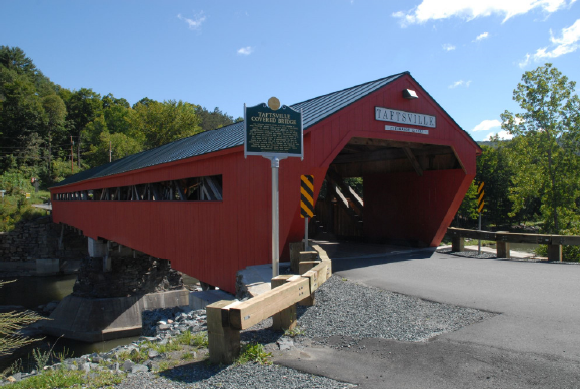 They have worked with owners of private covered bridges, county officials, and the New York State Office of Parks, Recreation and Historic Preservation to get New York's covered bridges listed in the State and National Register of Historic Places. To date, they have been successful in getting 9 out of the 13 that qualified included in these prestigious listings. 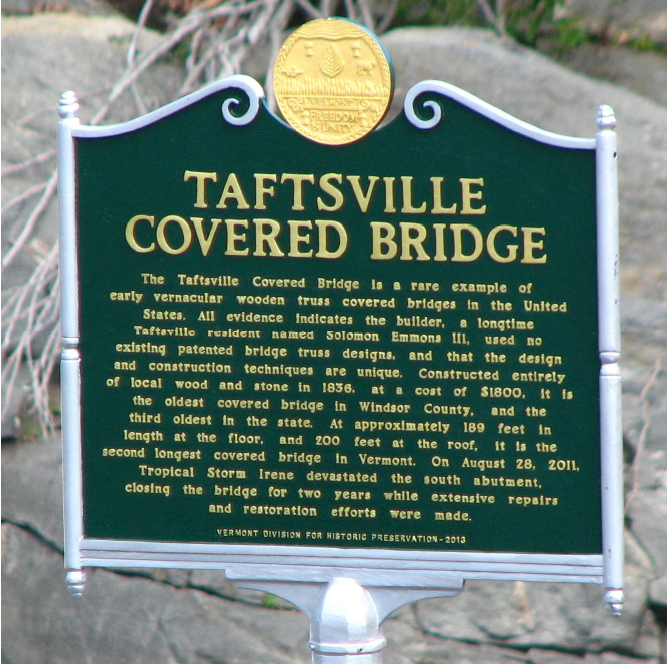 They are co-founders of Covered Spans of Yesteryear (www.lostbridges.org), a website documenting all known covered bridges ever to have existed in the United States and Canada, and to date, over 13,000 bridges have been recorded. Their most recent endeavor was the completion of a full-color, turn-by-turn driving tour of New York's covered bridges. When the Kane's aren't busy with covered bridge projects, Bob spends his time in his wood working shop and 4-wheeling. Trish spends most of her free time at the Theodore Burr Covered Bridge Resource Center in Oxford, NY where she serves as the Collections Curator for the center with much assistance from Bob. For information on how to order a copy of Images of America - New York State's Covered Bridges, or a copy of their driving tour, please contact them at 607-674-9656 or write to: 167 Williams Rd., Sherburne, NY, 13460 or email them at: bobtrish68@frontiernet.net. The Theodore Burr Covered Bridge Resource Center sponsored, for the very first time, a Fall Foliage Covered Bridge Bus Tour as a fund-raiser for the Center. Leaving from Hamilton, NY, on October 9th, fifty six feisty individuals participated in the tour. We were fortunate that Mother Nature cooperated and provided us with a beautiful autumn day with plenty of sunshine. A total of six covered bridges; one private and five public bridges were visited. After a brief stop in Esperance, where everyone enjoyed coffee and homemade muffins, the group continued on to our first bridge, the Waldbillig Covered Bridge in Albany County. We were warmly greeted by owner Michael Waldbillig who answered questions from a very inquisitive crowd. We continued on to visit New York's only intercounty covered bridge, the Buskirk, which is shared between Rensselaer and Washington Counties where the group enjoyed a bountiful bag lunch. Following lunch, we continued on to the three remaining bridges in Washington County; Rexleigh, Shushan and Eagleville. Participants enjoyed learning about our bridges and the various truss types and unique features of each bridge. After leaving Washington County, everyone enjoyed watching The Bridges of Madison County during the two hour drive to our next bridge, Hyde Hall at Glimmerglass State Park. Our day ended with a lovely and bountiful harvest dinner in the Lake View Room overlooking beautiful Otsego Lake sponsored by the Friends of Glimmerglass. Throughout the day everyone enjoyed the many door prizes that were offered in addition to two wonderful gift basket raffles. Participants departed with a bag full of covered bridge information and some wonderful memories of a fantastic tour of some of New York's Covered Bridges. According to the survey that was completed at the end of the tour, everyone had a wonderful time and wanted to know when the next tour would be offered. Well, we'll have to see about that! 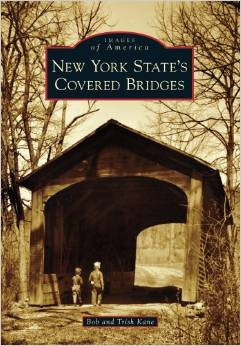 Published by the National Society for the Preservation of Covered Bridges. On Sale: $15.00. Profits will go to the Vermont Covered Bridge Society's Save-A-Bridge Program. For your copy send $15.00 plus $3.17 shipping to Joe Nelson, P.O. Box 267, Jericho, VT 05465-0267. New York State Covered Bridge Driving Tour Now Available! - Would you like to see all of New York State's Covered Bridges at your leisure in the comfort of your own vehicle? Well now you can! The New York State Covered Bridge Driving Tour is a spiral bound, full color tour which includes turn by turn directions and color photographs of each of New York's authentic and historic covered bridges. Included are the statistics on each bridge and an interesting history	of the bridge and the surrounding town, and old postcards of how the bridges looked during an earlier time.